After two intense days of picking and Tweeting, the Beat the Streak Colbert Challenge reached its conclusion last night. Albert Pujols — Stephen Colbert’s pick for Tuesday — homered in his first at-bat against Yuniesky Maya to give the Comedy Central host a two-game streak. @MLB’s selection — Kevin Youkilis — went 0-for-4 against James Shields and the Rays. The result: a Colbert victory with a high streak of two games. Mr. Colbert will gain full access to @MLB for a 24-hour period in the near future. Expect plenty of witty political banter, anti-bear propoganda and stern finger-pointing. Current co-leaders jdc5850 and sebringt both advanced their streaks to 29 games yesterday. A shot to tie the season lead at 31 could come tomorrow. No pressure, guys, but tomorrow is only one day after today. Interleague starting Friday & lasting til July 4th… Anyone like to throw out a strategy or two? Keep in mind that for the most part, pitcher vs. batter stats are skimpy and generally well over a year old. If you want to throw a strategy out there, please avoid debating it. No strategy is perfect and all will have holes, we know that. Let’s make it more for “food for thought”. — One possible strategy: Avoid picking 6-8 batters of AL teams in NL parks. AL pitcher a sure out most of the time; 6-8 batters may get 1 less AB vs. hitting in their own park. — May need to avoid many AL power hitters in NL parks. These guys may be the DH or 1B. And usually, just 1 plays and 1 may PH. lol, Ian’s picks are HORRIBLE! When I used to read Vinny’s blog daily, I noticed that the Beat the Streak Report’s picks normally hit .200 or less. Even I have done way better than that and I have a horrible start. Lav, there is no set strategy because nothing is set in stone but there is always a way and with interleague play upon us I think the Picks Of The Day could be good or even picking somebody who is playing the Twins, Astros, Pirates or Nats. Strategy = A method or plan of accomplishing a goal. @Vinny. Ignore last post. I misread your reply. Agreed, nothing is ever set in stone when the human factor is involved. But some strategies are better than others as proven by the 40+ gamers this game turns out each year. It’s ok man. This game is so unpredictable and this year nobody is at 40 yet and it’s half way through the season. Speaking of success in this game. If Kemp gets a hit today, may want to keep an eye on HomeRun4 (currently a 23-gamer on page 2). This is his/her 2nd 20+game streak so far. Don’t know how long of a gap between the streaks, but 1st streak was a 21-gamer. Highest “No Selection” 😛 pg# 5 with streak of 19 back to zero. 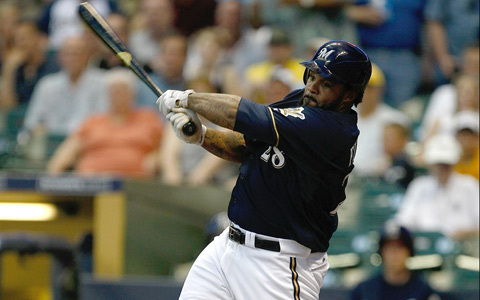 Yesterday’s Top2500 Reset rate was 26.64% with PRINCE FIELDER reseting the most. There was also 22.96>% PPD due to players not playing. These streakers do not reset, but did not increase either. Some more stats for today. There are 116 streakers at 19+ streaks today. Many are gambling their streaks on just a few batters. Here’s a quick breakdown of the most picked by those 116, about 65% overall. Those that picked Kemp have a reason for concern. Intentionally walked in 1st inning with 2 outs and just 2nd base occupied. Tells you what CIN game plan is: Don’t let Kemp beat you. Backfired on them with pitcher not able to find the strike zone. So, we’ll see. And there’s the hit for Kemp. Just to be complete. Now 73 made it past tonite. Either a homefield advantage scoring change occurred in DET or gameday reported bad info, but Mi.Cabrera ended up 1-4 not 0-4. Wipe-out Wednesday? At least 40% of the Top2500 streakers fall tonight, including our only Bloggers Group Top2500 member. Was just gonna say the same thing. Pretty healthy wipe tonight. Actually the leaderboard cleansing may be so deep, we might have 3 new Top2500 members tomorrow from our Bloggers Group. May take just an 8-gamer to get on the list. Maybe I did something wrong, but I am only showing 23.36% reset from the stats from Lav’s list? Where are the other 20% resets coming from? And Starlin & Fielder, each with 1 more AB left & 0-fer, can add another 3.6% to the slaughter totals. Miguel Cabrera was 1 for 4 today. That puts 9.76% back into the win column. So it appears. Was that a scoring change late in the game? I swear he was 0-4 and I doubt both 00Liber and I both missed that one. I looked at yahoo boxscore and the play by play reads that he reached on error but the linescore shows no error and that Miggy was 1-4. Still a healthy wipe even without Mig.